IT’S FALL!!! Well, I may be a little too excited for the ushering in of cooler weather down here in Florida, but I’m also excited that we get to dive in to some of our favorite fall learning themes. This week we are learning about how the seasonal change affects leaves. To introduce our new topic, we read some great books about leaves and fall. 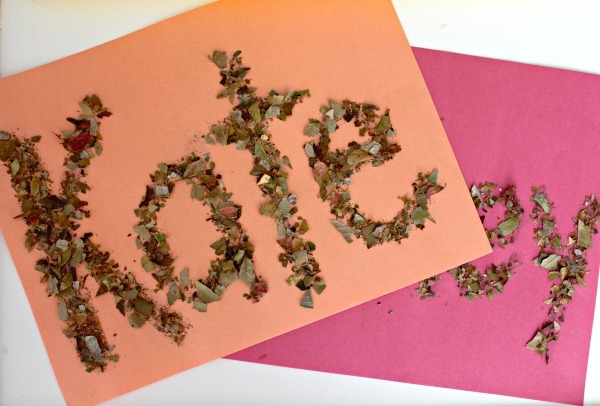 Today we are sharing a leafy name art activity using dried leaves. This fun hands-on activity will help build name recognition and spelling while also involving the senses. Any time we can incorporate getting outside to learn, it’s a hit! 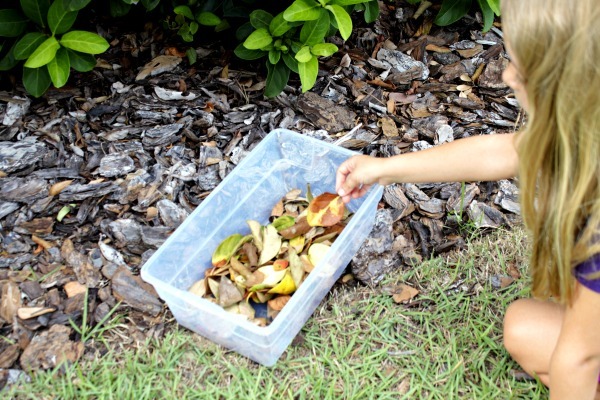 Nature walks are a fun way to immerse learning and nature. Whether you’re looking for certain colors, plants, or animals, getting outside is good for the soul! We started our leafy name art activity by heading outdoors to collect some dried leaves. The girls enjoyed hunting for leaves that had fallen beneath the trees. They immediately noticed how different they looked and felt compared to the leaves that remained on the trees. 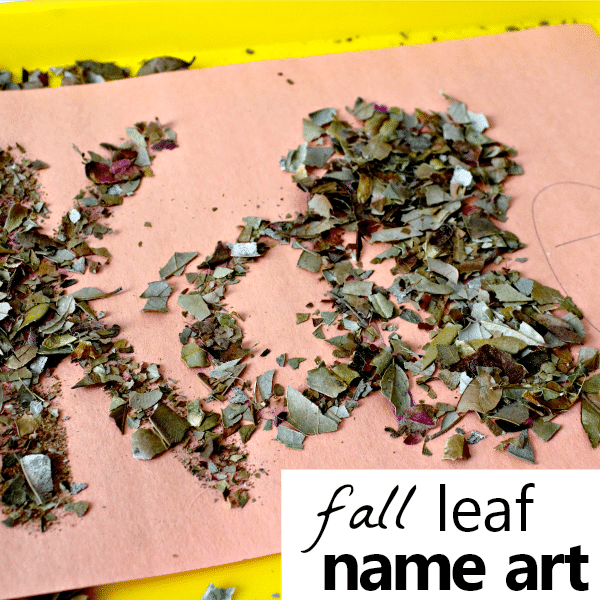 Once we filled our collection bin with dried leaves, it was time to get started creating our leafy name art. 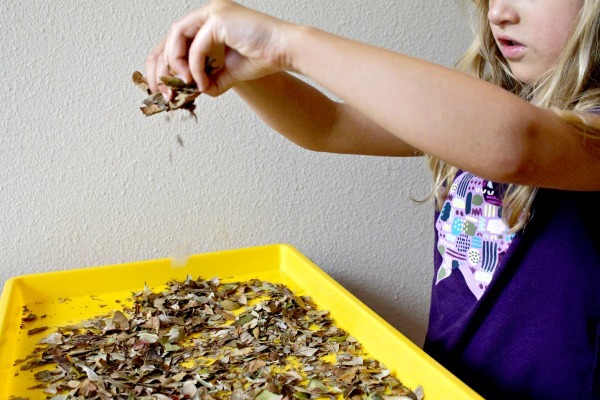 We first started by crumbling up the dried leaves into tiny pieces onto our tray. The tray is helpful in containing the dried leaf scraps. 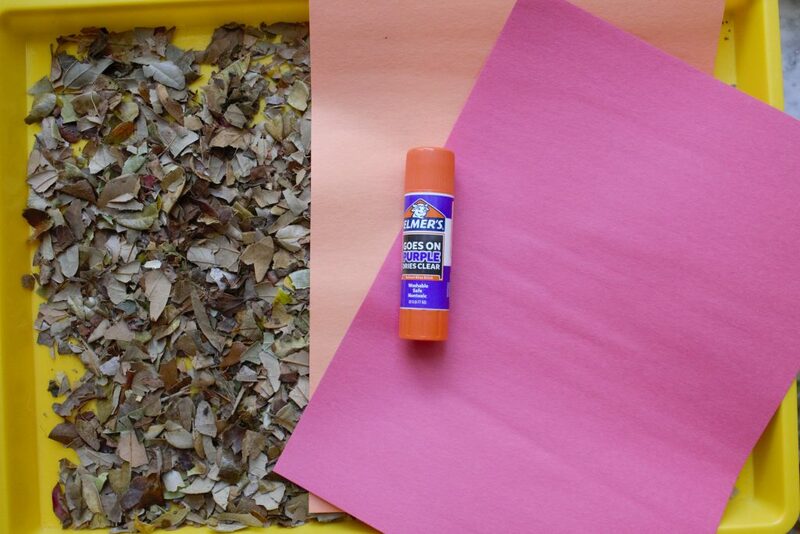 We definitely recommend making sure that your leaves are very dry so that they will easily crumble. The girls loved to hear the leaves crunching between their fingers. 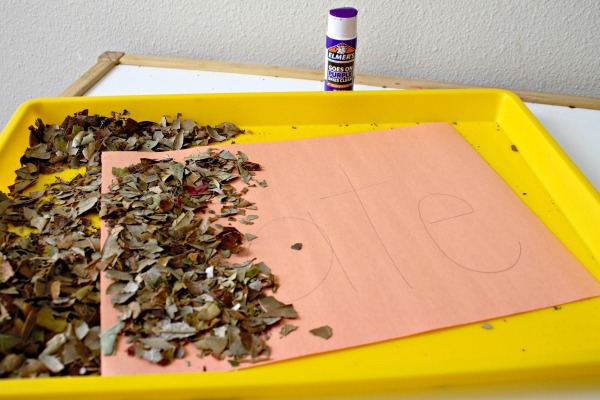 The sensory play in the dried leaf bin lasted a little longer and then it was time to begin creating our name art. We chose fall colored construction paper and my oldest one helped me spell out her name, filling the entirety of the construction paper. Next, she traced over each letter of her name with a wide glue stick. 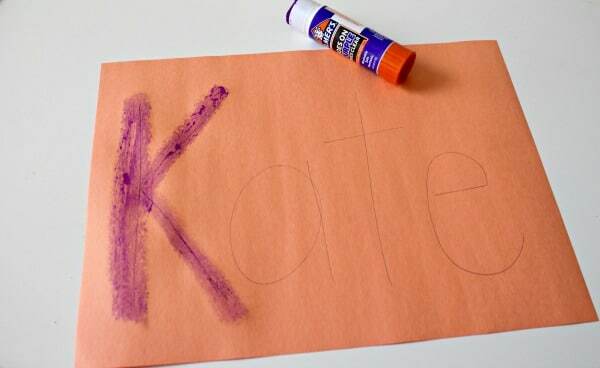 We recommend gluing one letter at a time as the glue stick glue dries quickly. Finally, the name art could begin! 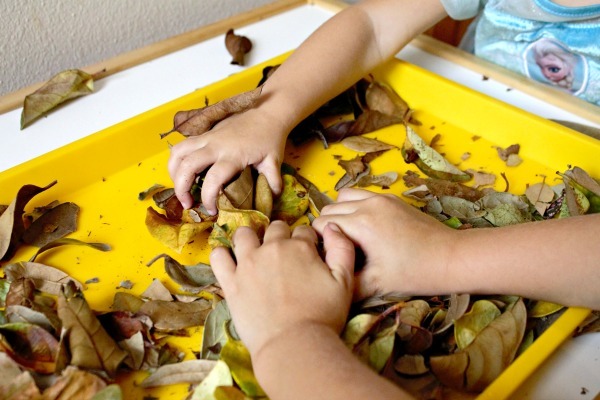 Holding the bits of leaves in their fingers, they pretended to let them fall onto their names just like the leaves fall off the trees. Pressing down on the fallen leaves helped them to stick to the glue. This continued until each letter was glued and their names were covered. 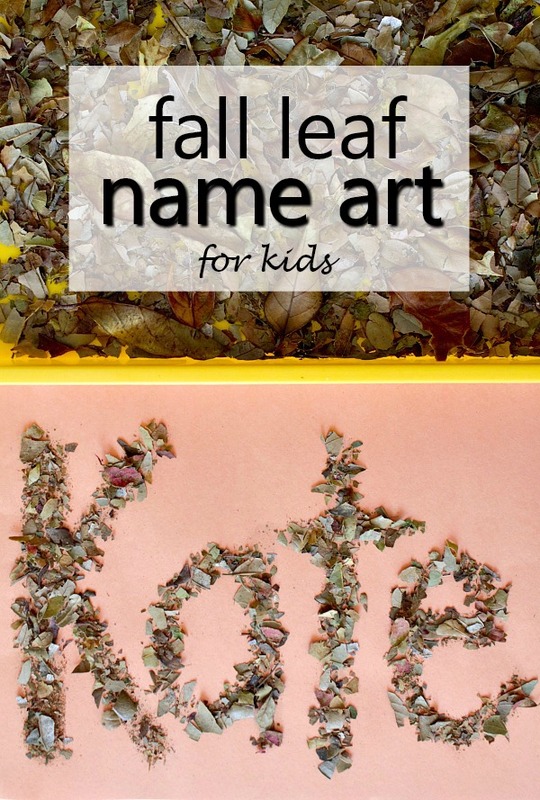 This fall name art activity was so much fun! It got us outside and using our senses to create a beautiful piece of art that will decorate our refrigerator this fall! 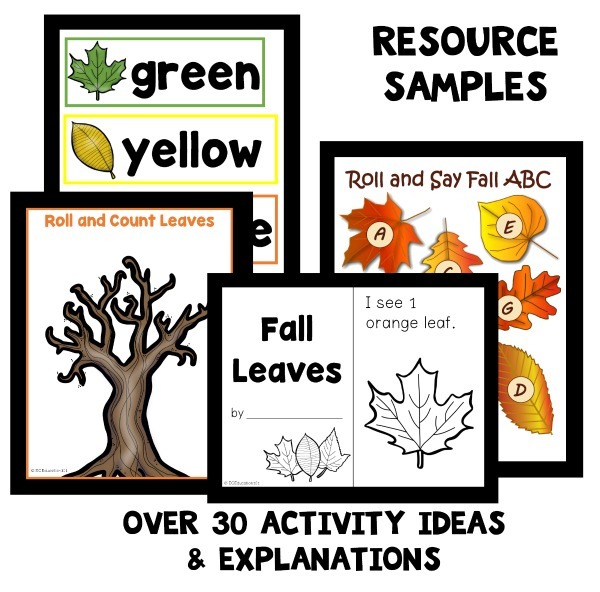 There are a ton of wonderful books to read for your leaf theme. 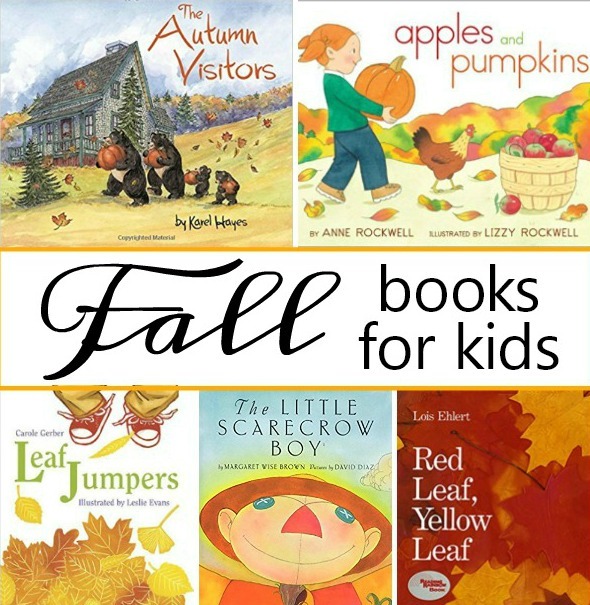 Below are some of our favorite picture books for a leaf theme. Bring the colors of fall to your kids with real photographs and nonfiction texts even if you can’t experience the changing colors in person. 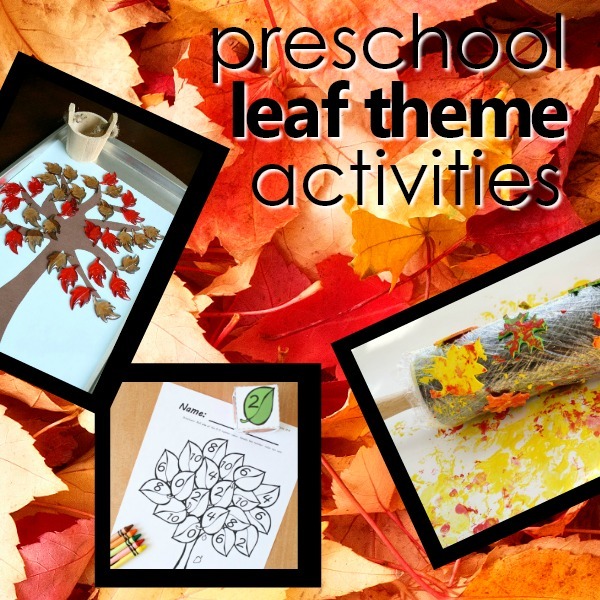 Visit our Preschool Leaf Theme Resource Page for more inspiration.